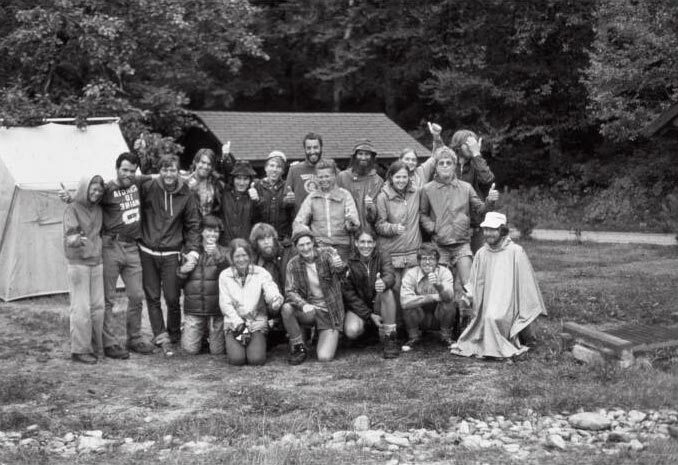 In 1975, Warren Doyle led University of Connecticut students on the first of his A.T. Circle Hikes. Members pledged to support each other along the way resulting in all members finishing the trail that year. Front row: Leslie Scott; Ginger Bowes, David Hall, Kirk Sinclair, David Eveleth, Kenneth Bell, and Jeff Peterson (standing). Second row: Naydine Simonds, Warren Doyle, Steve Messier, Randy Eis, Steve Markiewicz, Gary Ardel, George Puglisi, Katie Brown, Marty Marcus, Barb Dyer, Rachael Cohen (partially Hidden - was the support van driver), Don Pelletier, and David Beffa-Negrini.